The Para-Dyne amps are named for their two foot-switchable channels of extremely dynamic tone! A huge range of tones is available and the amp maintains clear note definition even at high volume and gain levels. Channel one ranges from sparkling clean to classic overdrive and loves pedals. Channel two can take you from warm and cleanish to crunchy British tones, to smooth sustaining high gain, to scooped chunky 70s and 80s metal. Its compact size and reasonable weight makes it easy to transport and set up. A “triode/pentode” switch is provided on the rear panel to switch the power output to around half of its full power rating for smaller gigs. The super-durable construction is road tough and the Para-Dyne 50’s medium power output is perfect for all but the smallest venues. A buffered and bypassable serial effects loop is standard. Like most Andrews Amps, the Para-Dyne has external bias test points and an adjustment pot for making output tube replacement quick and easy. The overall feel of the amp is dynamic and uncompressed, providing clear note definition even under the highest gain settings. Available in 50 watt and 25 watt models. Scroll to the bottom of the page for sound clips and videos. Power output is switchable from 50 watts to 25 watts and powered by a pair of EL34 output tubes and driven by three 12AX7 preamp tubes. The clean channel has classic warm tones and loves pedals. It features a six position Depth switch and a three position bright switch. The overdrive channel is think and warm with good sustain. Output power: 50 watts RMS (before clipping) switchable to “half-power”. Cabinet: Finger jointed Baltic birch. 12 year old Reese Boyd gets some great tones from this Para-Dyne 50 and does a stellar job playing Todd Rundgren’s Utopia Theme. The three samples below were played and recorded by Carl Culpepper. 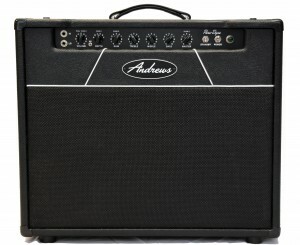 The cabinet was the Andrews 2X12 Extension cab. An SM57 was placed in front of each speaker. No processing or EQ was used other than a little reverb. The next two clips were performed by Grant Reynolds and recorded by Jeff on a Zoom R16. Les Paul with Sheptone Tribute pickups – Neck pick selected- Gain on 4. The clips below were recorded and played by David Dawson with an SM57 in front of the amp. No effects or signal processing was used. – Some Rock n’ Roll on the lead channel with gain on “5” with a Les Paul, Celestion G12-65s. – Metal sounds on the same guitar on the clean channel cranked to “10”. – Different Metal tones on the Les Paul again. This time the gain is set to “9” on the lead channel.